When I think of pasta, I immediately think of Italian style dish and tomato sauce. But as I find new recipes and read new cookbooks, I find that pasta can be prepared in so many ways. 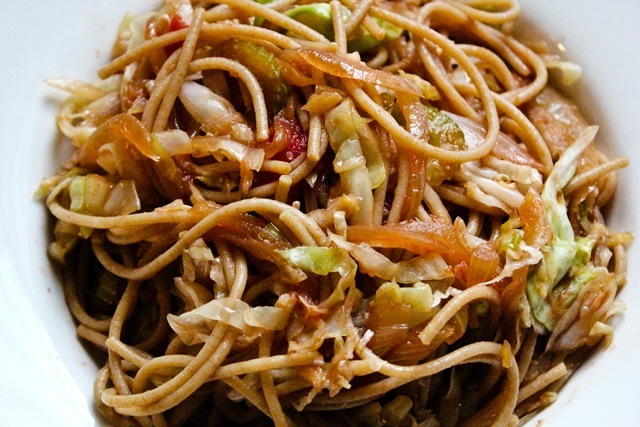 This unique recipe from The Kind Diet cookbook has pasta but also includes a lot of cabbage, onions and celery. At first I was skeptical about this recipe, soy sauce in pasta? do I really need to put a whole head of cabbage? Yes and yes. I like how the cabbage adds great texture and volume to the dish. 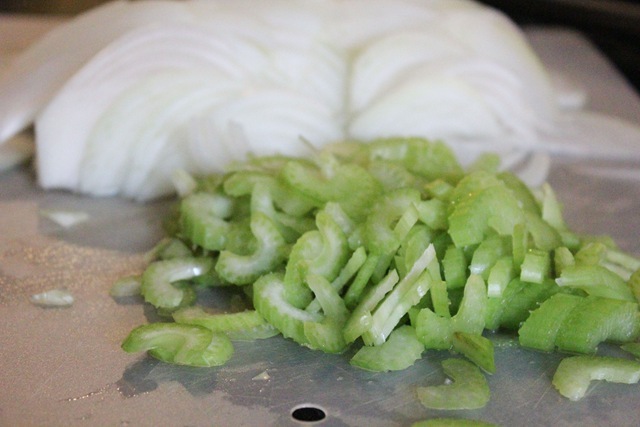 After cooking, the cabbage will wilt down to more than half of it’s pre-cooked size. Whenever I look at a pasta recipe, I usually want to add more vegetables than it is called for in the recipe. I like this recipe because Vegetables > Pasta. Bring a large pot of water to a boil for the pasta. Salt the water and add the pasta. Cook just until al dente. Drain the pasta well. Heat the olive oil in a large skillet over high heat. 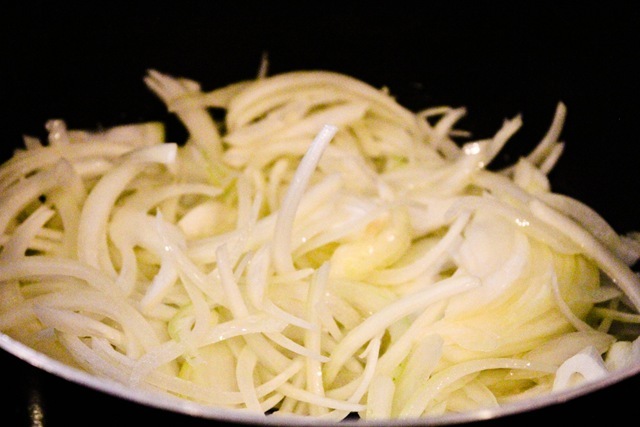 Add the onions and cook for 7 minutes until softened. Then add the garlic and saute for 3 minutes longer. The onions should transparent and turning golden. Add the celery to the skillet and saute for 3-4 minutes. 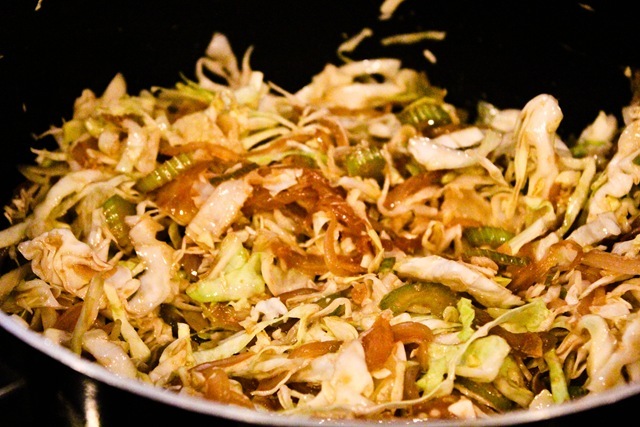 Stir in the soy sauce, salt, garlic powder, then add the cabbage; saute for 4 minutes. Reduce the heat to a simmer and cook for 5 minutes longer. Add the pasta to the skillet with the marinara sauce and toss together. Cook over medium-high heat for a few minutes and serve. I served my pasta dish with garlic bread and salad. I added turkey meatballs to the pasta for the husband’s plate. 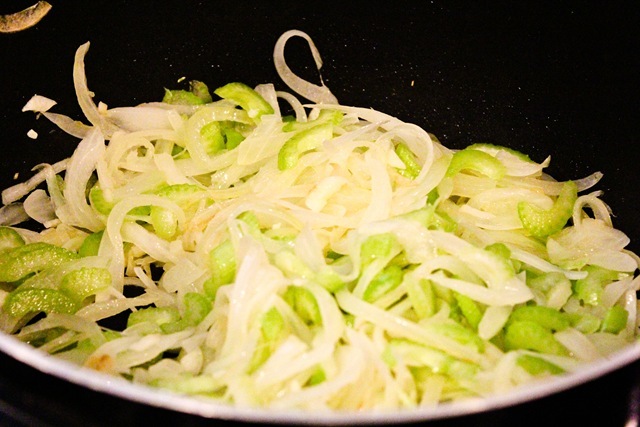 I’ve also made this recipe without the pasta and served it as a cabbage, onion, celery side dish. You can see the other dishes I’ve made from this wonderful cookbook –> Collard Greens, Sweet Potato Lentil Stew and Moroccan Couscous. This sounds totally interesting! The man isn’t a cabbage fan…otherwise this would TOTALLY be on my to make list next week! i LOVE cabbage w pasta! This looks delicious! I’ve been on a big pasta kick lately, too. I also always add more veggies to pasta dishes… and just about every other meal, too! I’ve never had cabbage with pasta before but I guess it’s just like preparing a Chinese-style noodle dish. Very interesting, thanks for sharing the recipe! Wow, this recipe looks really great and something both my husband and I would LOVE! I am a huge cabbage fan and can’t believe I’ve never thought of mixing cabbage and pasta before! I can’t wait to try this recipe sometime in the next week or two! 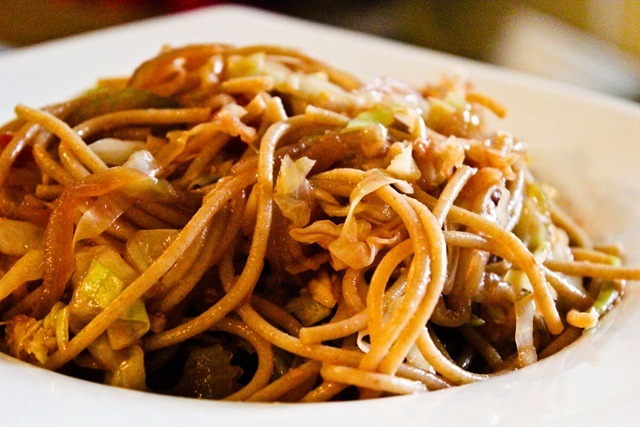 Oh this looks a lot like this Indonesian dish called Bami that my MIL taught me how to make. Yummm. instead of the marinara sauce they use Maggi and the Sweet Soy Sauce Kecap brand. I’m definitely going to try this.